The basic building blocks of all life are water, oxygen, minerals and sunlight. Water may seem to be an obvious requirement, especially to a trout, but not just any water will do. It must be of the proper temperature, it must be free of toxic substances and it must carry oxygen and desirable minerals in quite specific volumes and proportions. Oxygen must be present in the water at a concentration of at least four parts per million in order for trout to survive. However, water’s ability to carry oxygen is dependent on its temperature, and the warmer the water the less oxygen it can carry. Ironically, the warmer the water gets, the more oxygen trout need because they are cold-blooded creatures whose metabolic rate increases as the environment warms. In fact trout need about four times as much oxygen at 24° C as they do at 4° C, and this is a strong determining factor in where they can live. Trout need places where the dissolved oxygen level is consistently high or the water temperature is consistently cool or where there is some happy combination of both. Water temperature and oxygen content always go together, and when we read or hear about a fish-kill caused by water that is too warm, it is usually more accurately described as oxygen deprivation brought on by high water temperature. Plant life in the stream also affects the dissolved oxygen content of the water. Through photosynthesis, green plants produce oxygen in the daytime, which is beneficial to the trout. However, the same plants use oxygen at night, and too many of them in the stream can rob the water of oxygen during warm summer nights. It can be a case of too much of a good thing. 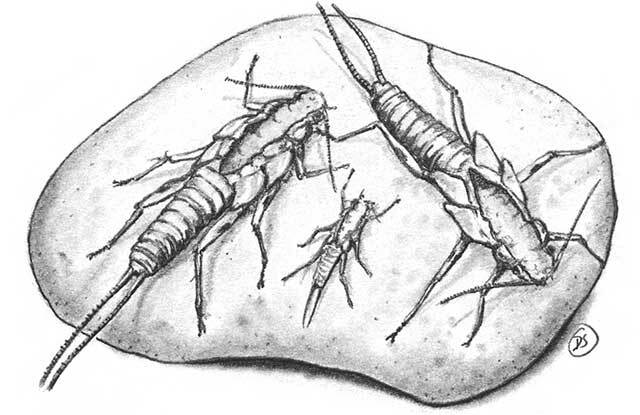 The food chain in a trout stream goes something like this: Trout eat aquatic insects, aquatic insects eat zooplankton, zooplankton eat green algae, and green algae “eat” minerals. Without the right minerals there are no algae, no chain and no trout. There are many beneficial minerals, but the most important are calcium and carbon. Calcium reacts with oxygen and carbon dioxide to produce calcium bicarbonate, which is the mineral most easily “eaten” by the green algae. Water high in calcium bicarbonate is alkaline and carries a healthy batch of green algae, large aquatic plants, aquatic insects and ultimately trout. The final critical ingredient is sunlight, which is used by green plants to help convert inorganic chemicals into organic matter fundamental to the food chain. Most of Alberta’s trout streams receive adequate sunlight, though occasionally suspended silt can inhibit sunlight’s penetration and limit the growth of algae on the stream bottom. With the essential building blocks in place we have a place where trout can survive. But the addition of some other ingredients can make the difference between surviving and thriving. The first of these is stability, the absence of sudden or severe fluctuations in either temperature or volume of flow. Stable temperature keeps the trout and its food free of dissolved oxygen deficiencies and promotes growth of a diverse insect community. Stable flow allows fish to adopt a “routine” without having to move their place of residence every time the water level goes up or down suddenly. Two other desirable ingredients in a trout stream are phosphorus and nitrogen. They act as fertilizers in the stream, just as they do on our lawns, stimulating plant production and promoting advanced growth throughout the food chain. Phosphorus and nitrogen can come from natural sources, like leaves and woody debris that fall into the water and decompose, or from artificial sources like cities and towns located along the waterway. Moderate amounts of these chemicals can be of great benefit to a trout stream, but excessive amounts can stimulate plant growth to the point where dissolved oxygen problems occur. Other factors that enhance the productivity of a trout stream are an abundance of food and the presence of suitable habitat–neighborhoods where the fish have safety from predators and shelter from heavy current. Trout also need access to suitable spawning water either in their home stream or in a tributary to it. The perfect trout stream would be cool, stable and somewhat alkaline, with lots of green plants growing both in and around the water. It would have abundant insect life as well as plenty of hiding places for trout, and would have good spawning water nearby. That’s a long checklist and not many streams make it on all counts. One type that does is a spring creek, so called because its source is an underground spring. The spring releases water of constant volume and temperature throughout the entire year. The water is high in calcium, and its alkalinity stimulates plant growth. In addition, a spring creek is not part of the drainage route for mountain snowmelt, and consequently is unaffected by runoff. A spring creek’s groundwater source and constant temperature keeps large portions of it free of ice in winter. Spring creeks, also sometimes called limestone or chalk streams, are among the most productive and celebrated trout waters in the world. Sadly Alberta has only a very small number of spring creeks, the most noteworthy being the North Raven River, also called Stauffer Creek, northeast of Caroline. Streams with more conventional snowmelt sources are called freestone streams, and most of Alberta’s trout waters fall into this category. They are usually not as rich in minerals nor as stable as spring creeks because of the nature of their sources. The best freestone streams, though, have adequate mineral content and undergo the inevitable seasonal changes in temperature and volume gradually rather than suddenly. This is often the case when the stream flows out of a lake or muskeg bog. The lake or swamp acts as a giant regulator, collecting snowmelt, adding minerals and releasing water to the outlet stream at a relatively constant rate. The Crowsnest River and some of the streams in the Peace River drainage are good examples. Many people’s image of trout fishing comes from the clichéd calendar photograph or beer commercial showing an angler knee-deep in the headwaters of an icy creek with majestic snow-capped mountains rising straight out of the water behind him. He is usually in the process of netting a six or eight-pound rainbow. This looks wonderful, but I’m afraid it’s mostly Madison Avenue stuff. If I were a complete skeptic, I’d suggest that the photographer brought the huge trout with him as a prop. Most streams like the ones in these photographs are not very productive and simply won’t have many big fish in them. The reasons are many. The growing season in the headwaters is short, and the climate is harsh. The gradient or slope of such streams is often steep so the water velocity is high and runoff scours the stream bed each spring. Even in places where the slope is more gentle, the water probably freezes right to the bottom in winter. Most significantly though, the water here is nothing more than melted ice. It is very pure, carrying few minerals and little phosphorous or nitrogen. The only sources of nutrients in the headwaters are the plants growing along the stream. The result is that the typical high mountain stream has very little algae growth and a very weak food chain. In Mother Nature’s original plan, there was a fish capable of survival in these headwater areas. It is the bull trout, which has a voracious appetite and the ability to live long and grow large if man doesn’t interfere. But as we have seen, man has been interfering with Alberta’s bull trout for a century or so, and big ones are less common than they once were in their original headwater range. So while the headwaters are not the best of trout neighborhoods, neither are the extreme lower ends of Alberta’s streams. A hundred and fifty kilometres from the mountains the rivers have slowed down and warmed up, and there are few riffles or rapids to inject oxygen into the water. They may now carry too many minerals because of the accumulated influence of cities, towns and irrigation. Perfect examples are the lower reaches of both the Bow and Oldman rivers in southeastern Alberta. The middle sections of many of our streams, however, are a sweet compromise. As a stream moves from the mountains into the foothills, several significant things happen. Its gradient declines, which increases the amount of suitable trout habitat. It enters a friendlier environment at a lower elevation, which provides a longer growing season and reduces the likelihood of freezing to the bottom. A foothill creek flows through forest or farmland, and its streambed is composed of gravel, silt and soil instead of just rock as in its headwaters. Decaying leaves and plant material, animal waste and minerals wash in with the spring rains, providing nutrients to stimulate green plant growth. The stream also may flow through geological formations that leach calcium and other minerals into the water. 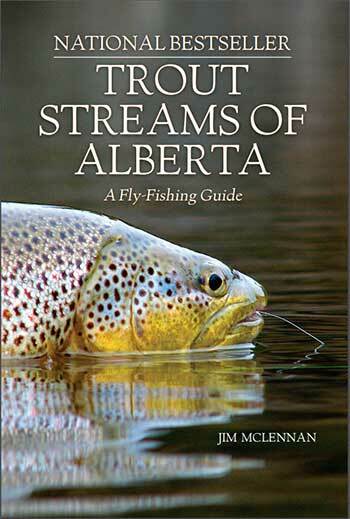 So trout fishers in search of Nirvana in Alberta find it in the streams of the western foothills, near towns like Pincher Creek or Sundre or Grande Cache, where aspens and willows mingle with evergreens to provide shade, cover and nutrients to the trout. Knowledgeable fly fishers are drawn to these gentle and aromatic valleys, knowing that finding trout begins with finding trout habitat. Excerpted with permission from Trout Streams of Alberta: A Fly-Fishing Guide by Jim McLennan (Fusion Books, 2015). All rights reserved.